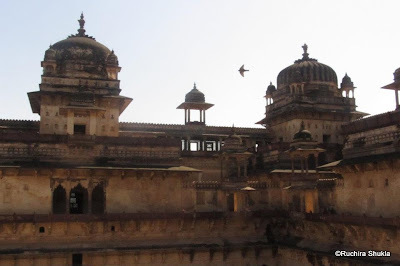 And today, from the mountain passes of Ladakh, I take you to Orchha - In the heartland of India ! Orchha is a small town in the state of Madhya Pradesh. 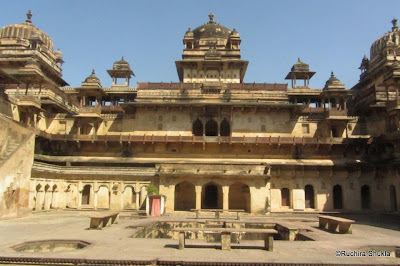 It was established by the Bundela king Maharaja Rudra Pratap Singh in 1501. 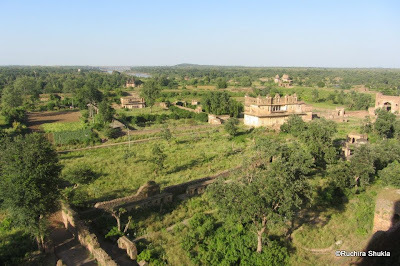 Orchha is near the better known Khajuraho and most people end up bypassing it on their way there. But luckily, thanks to the insistence of a friend we didn't. She suggested we stop over at Orchha and stay the Sheesh Mahal – A palace that has now been converted into a hotel. And what an excellent decision that turned out to be ! The Palace is on top of a hill, surrounded by an almost forest like area. The ambiance was beautiful and incredibly peaceful. Our hotel rooms were in the actual Palace and although it was not as grand as the palaces in Rajasthan, we did feel like royalty. We had a whole floor to ourselves. With a courtyard, a sitting area and a beautifully furnished room ! 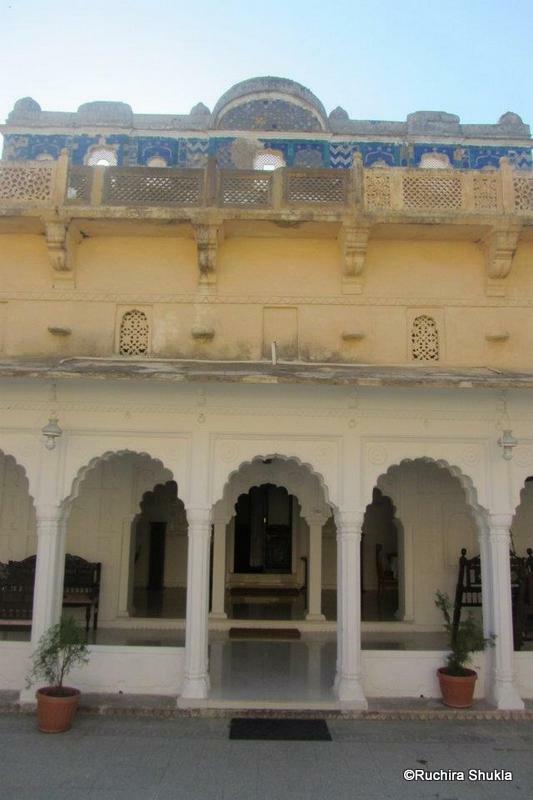 The best thing about staying at Sheesh Mahal was that we were actually staying in the vicinity of all the palaces. So to visit them, all we had to do was come down from our room ! 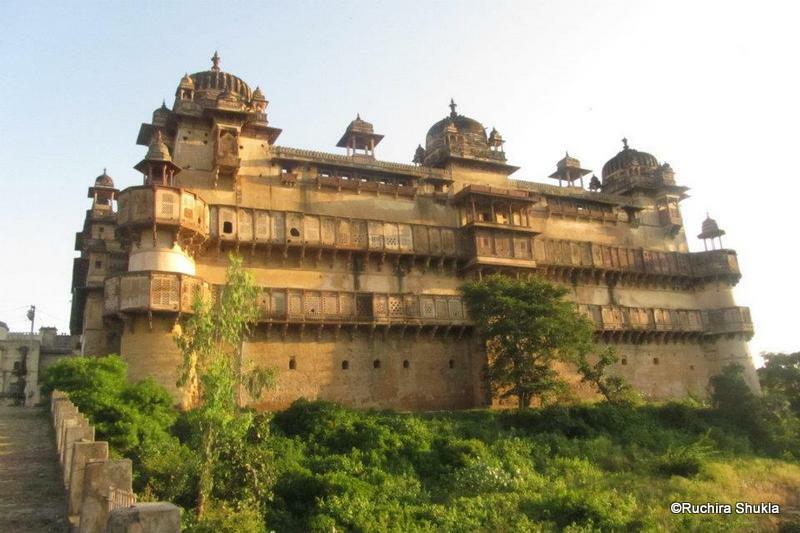 We visited the Jehangir Mahal that was built to commemorate the Mughal emperor Jhenagir's visit to Orchha. It is stunning with its intricately carved network of columns, lattice windows and hanging balconies. 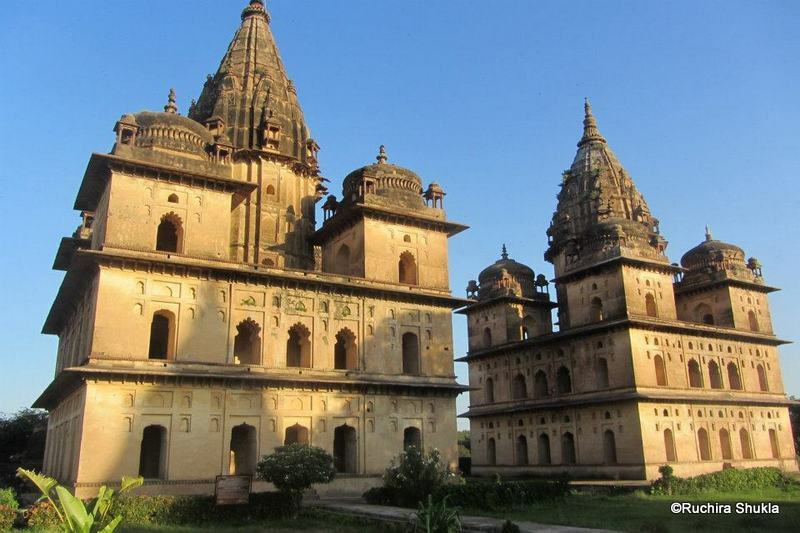 Orchha is also famous for the Chaturbhuj Temple, dedicated to lord Vishnu.It was built over a period of 20 years in the late 16th century. But the one thing Orchha is most famous for is its magnificent Chattris or Cenotaphs. 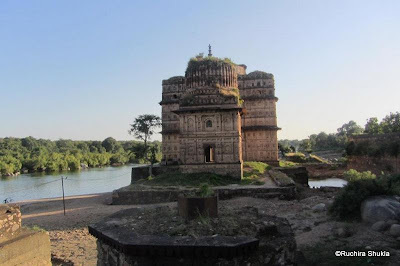 There are about fifteen cenotaphs of the Bundela rulers and members of their family on the bank of the Betwa river. The best time to visit the Chatris is at Sunrise or sunset. The rays of the sun falling on the stone structures make them look really beautiful. We went there a little before sunset. After visiting the Chatris, we walked down to the River. Most of the tourists had left by then and we had the place to ourselves. 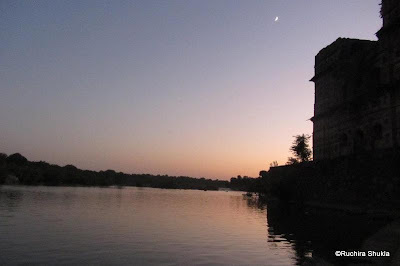 We sat on the bank and watchedthe sun set over the Betwa River. No Nandana .. not all travelogues :P But i do like to do them ! Looks like an amazing place. I had actually never heard of this place as a tourist attraction before, but I guess, it must be visited once. Yes, it is worth a visit ! What a place to stay. Even the loo has a view that's stunning. And you only had to walk down to see other places nearby. Another wow. Yes that was the best part. We were in the midst of so many beautiful things ! A very much less known place has now been brought to prominence by this blog. No doubt Bundelkhand is a historic place whose territory extended from Jhansi to Varanasi during Sepoy mutiny 1857. I shall now make it a point to suggest to various tourist agencies to include this city in their tourist map. 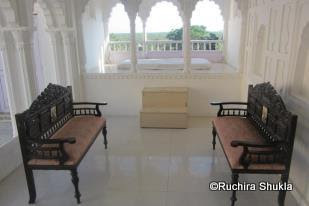 Availability of good and comfortable hotel is added attraction. 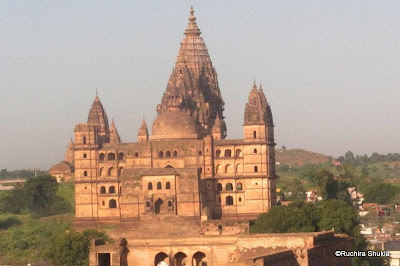 I think a lot of tourist agencies do include it but people by pass it for the more popular Khajuraho ! Splendid pics. Even I was not aware of this place. Thanks for bringing it out! Welcome here ! Glad you liked the post ! One more added to my list. A grand place to stay indeed! Yes it was grand and beautiful ! Yeah our royalty did lead a wonderful life ! Great pictures, as usual, though how I wish they were bigger in size. I wish I knew how to make them bigger in blogger ! LOL .. I suppose this loo will pass in your judgement ! 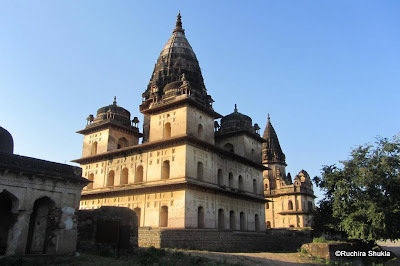 I read about Orchha in my Master's and have been intrigued since!! I will call you first when we are finalizing out plans to get the details!! Its a must visit ! AWESOME IT IS TO STAY There !! I love history and architecture too ! That is why I am always attracted to these places ! Thank you ! The lodging was the best part ! Wow! The buildings are amazing. How tiny a person must feel standing next to one as she gazes up at it. And to think how old they are! Ancient ! and still so well preserved ! Wow...what fantastic architecture and views. Amazing! Thats what makes Orchha so beautiful. Great views and fantastic architecture. Nice pics, lovely place. There is something about places less explored, isn't there! Gwalior is another beautiful place ! What an amazing place! India is so full of little known sites such as these that most of us didn't know about. Now thanks to you, we do. Amazing.. I have immediately added it to my places to visit list. Thanks for sharing.. The idea of staying in a palace in itself is eclectic .. Incredible! Long time no travel and tourism. That means you need to take a holiday soon ! Wow girl, Loo ka view aisa tha so the rest I can just imagine. I honestly feel you ought to be a travel writer. The sooner the better. You certainly have a way with pics and words. They make the narration come alive. I didn't know this place existed. 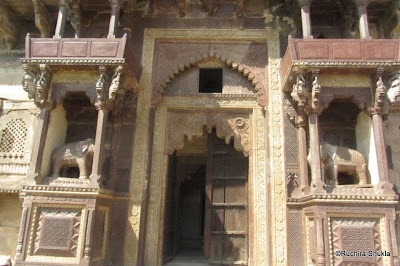 Now another one for a must visit. Ruchira, I will be the first one to buy your travel book, seriously. I just love the way you describe the view and the pictures speak volumes too. DO IT NOW, JUST DO IT. :P Coming from you that is a great compliment ! Incredible India and amazing pictures. I loved the view from the loo. A loo with a view. That would be a nightmare for my better half, I might never come out !! Ye sit is isnt it ! My goodness!! This is truly a hidden gem!! Why don't people advertise these places better?!! it was a gem indeed ! I have never heard of this place before. Loved the pics of the palace. And the Loo view is amazing. The city of historic palaces and temples nestled between forests and vegetation livens up in monsoons.